Melih Youtube: "There I go again"
As this book begins, Mr Daniels tells you about how he came to write this book on a legal notepad, which is something I as a reader can truly appreciated. I love when an author actually chooses to write their own story and then has it edited, especially in a biography. This part of the story, just drew my attention in to the book even more. The story continues with how Mr Daniels, talks about the first time he won an Emmy, which I consider highly deserve. As the story continues, you are taken back to how his acting career begin. He tells the reader how his mother invested her time into her children's career, while maintaining her own career. He really takes the time to give great little details to the reader like the examples above. I love how this book is written, how its more like family stories being told to a fellow love one instead of an actual book. I think this book has such a family comfort warm feeling to it. I would recommend anyone who enjoy Mr Daniels characters while growing up, to check out this book. I love that as the book continues, you really great to know Mr William Daniels better as a person. I also felt like I came to appreciate his talent even more, and isn’t that what an autobiography is all about. Overall this book was a charming story about an actor’s life that I truly admired. I will also be purchasing the actual book when it comes out because I love this story so much, I would encourage you to do the same. I give this book a 4 out of 5 stars for the excellent writing and the great little details. 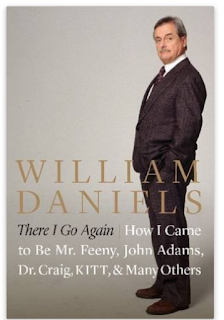 I especially think if your a Mr. Feeny Fan or a William Daniels fan in general, you will truly enjoy this book. I felt like I was listening to a family member tell me childhood stories instead of an actor talking about his life. I just can’t get over how will written and detail this biography was and how much more I will enjoy Mr. Daniels now as Mr. Feeny, after reading his stories. I will link below where you can find this book when its releases. Thanks for reading and please come and join me again soon for another review..